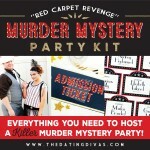 Need a fun idea for your next group date night? 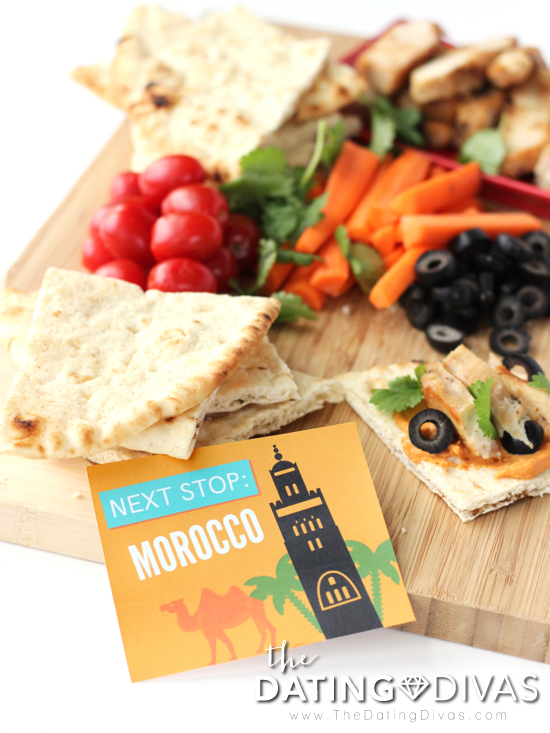 Make it a Travel-Themed Progressive Dinner Party!! If you love to travel and enjoy different cultures, get out with friends and eat good food, this is the date for you! It’s always fun to go out to a restaurant, but sometimes it can be a little expensive to dine out. Dining at home can make for a more relaxed environment (and budget friendly!) to enjoy spending time with your couple friends. This is such a unique group date night that lets you travel around the world in one night, without the costs of plane tickets! The first date that my husband and I ever did from The Dating Divas was The Passport to Love! We fell in love with these travel-themed date nights and we were so excited to try out more Around the World Date Nights. On these date nights, we traveled to China, Italy, Greece, Jamaica and more. 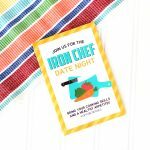 We decided it was high time we share our love for these travel-themed dates with a progressive dinner date with friends! 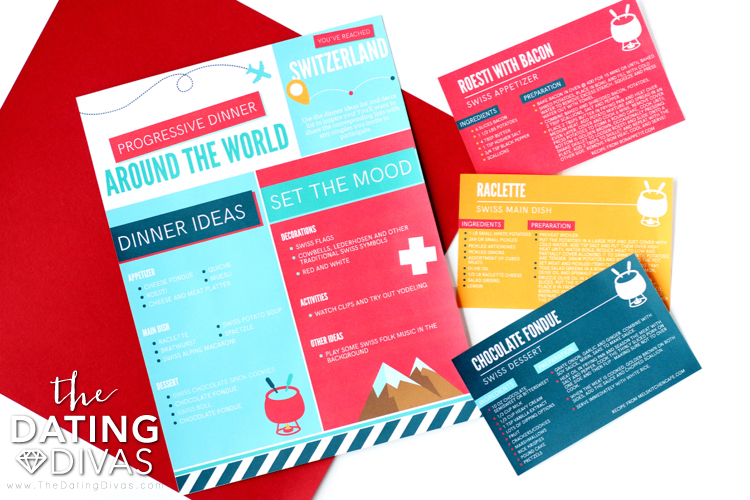 With the help of Carisa from Messes to Memories we’ve created a fun printable pack to help you plan and host your own travel-themed Progressive Dinner Party! A progressive dinner is a special outing where you enjoy different courses of a meal in different locations. For our date night, we invited 2 other couples to participate and I worked together with the wives to coordinate all the logistics. Each couple was assigned appetizers, dinner or dessert, and a country. Now we were ready for a fun WORLD TRAVELING date night. You may want to discuss with the other couples how they want to put this fun group date night together, you’ll definitely need to work out the logistics for your own unique situation. 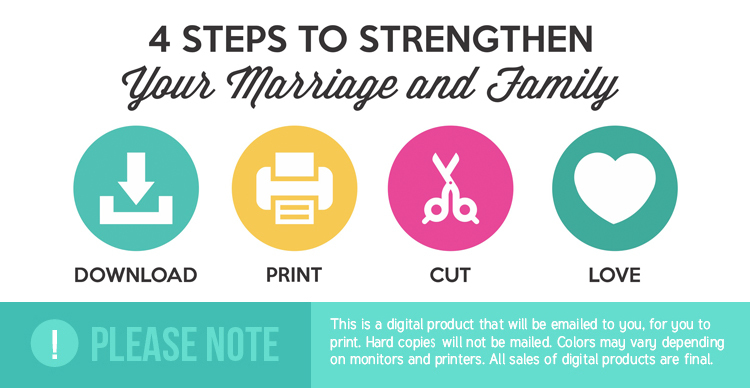 Option 1: Each couple can use one of the five country ideas included with these printables OR choose their own country. 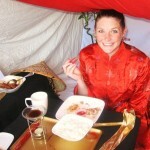 Option 2: Each course can be served in three different homes and after each course, you can travel to a different home. If you choose to do this, then couples will need to decorate and prep as much food as possible before date night so that when serving time comes around there isn’t a long prep period. Option 3: Come together for date night and cook in the same kitchen. This could get really messy, but you’ll be able to enjoy everyone’s company while you work! The second option will need a little intermission after each course so you can clean up a bit and decorate for your next stop. Option 4: Turn this progressive dinner into a month of travel-themed dinner parties with your spouse and visit one country a week. You could even make this into a family date night activity and learn about different countries together! Every great date includes an adorable invitation to build anticipation! 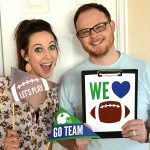 So we’ve created a fun invite that one spouse can present to their date (since you’ll be planning this date with the other couples, one spouse will already know the details). 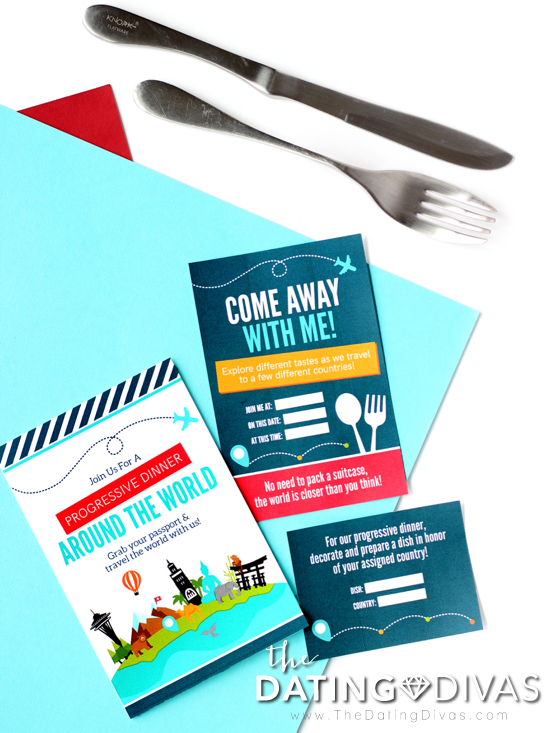 The invite includes space for you to share all the details about your Around the World Dinner Party. Now you’re ready to travel the world. 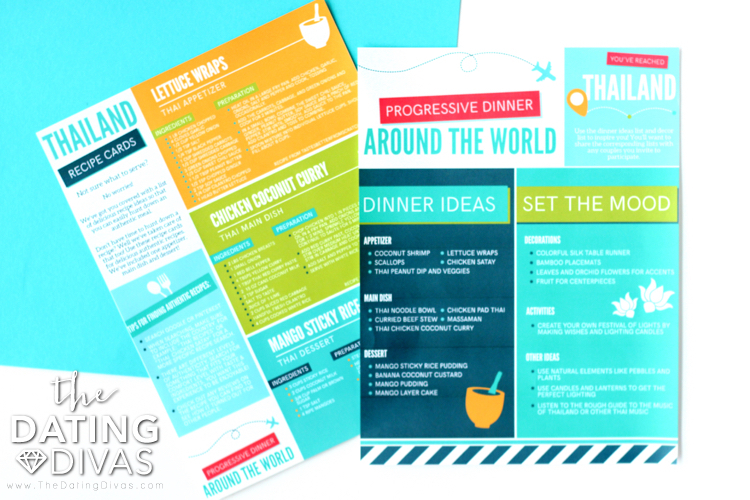 We wanted to make this date as easy as possible for everyone involved so we brainstormed unique, traditional and fun dinner ideas for 5 different countries, including dinner menu ideas, recipes, activities, decor and other ways to set the mood. 3 recipes for each country, one appetizer, main dish and dessert! If you choose to do one of the recipes included, you’ll be set!! But don’t feel like you have to choose one of the given recipes. Part of the fun of experiencing different cultures is getting to learn a bit about them, so do a little pre-date research with your spouse and decide what you want to do! When date night comes around, everyone should be prepped and ready to go! After you enjoy each course, you’ll open an envelope that will reveal your next destination. 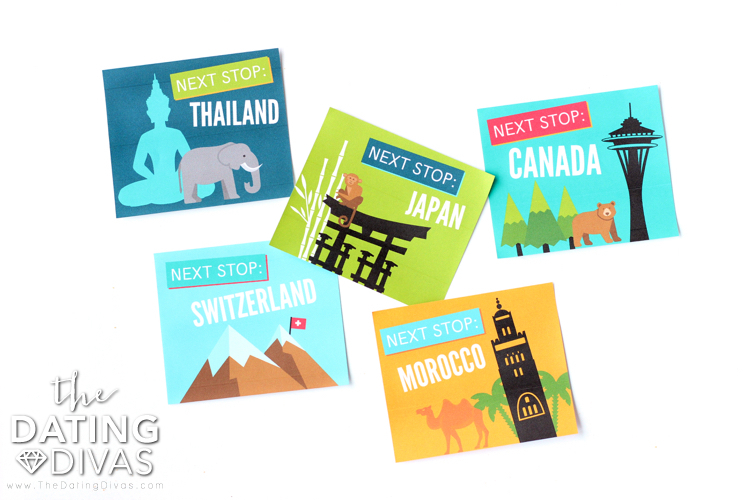 We have cards for Thailand, Japan, Canada, Switzerland, and Morocco! These countries are some of the best places to visit around the world. Of course, you’ll have to choose just 3 countries to visit – one per course. Unless you want to do all 5 and eat double appetizers or dessert, we won’t tell anyone! Our first stop was Morocco! We learned the most about this country and its brilliant colors and patterns. The food was so delicious we’ve been hooked. We’ll definitely be revisiting Morocco again soon! 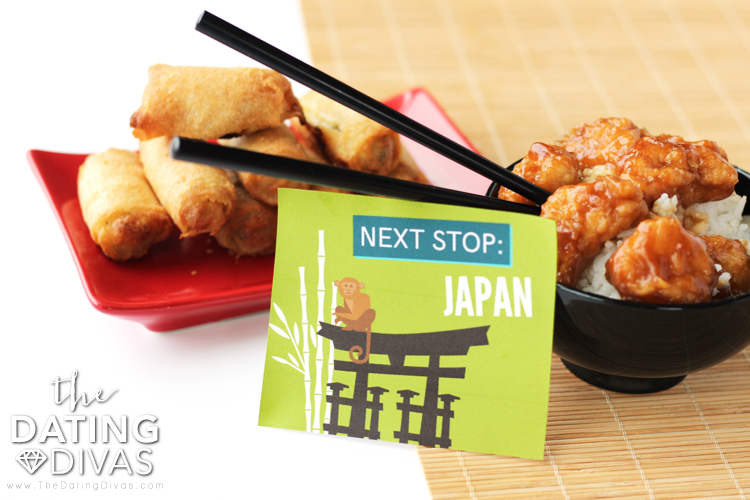 For our main course, we zipped on over to Japan where we enjoyed Ginger Pork and Spring Rolls!! MMMMMmmmm. And for dessert, we finished up in Switzerland! 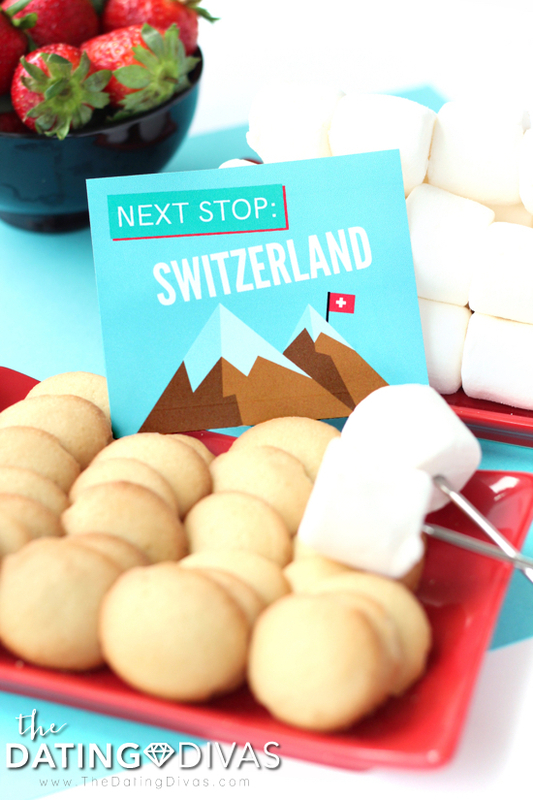 When you think of Switzerland your mind jumps to fondue, doesn’t it? We decided to keep it classic and had a delicious chocolate fondue bar! What a way to end the night! Enjoy your own Around the World Progressive Dinner Date and travel the world with some of your friends! 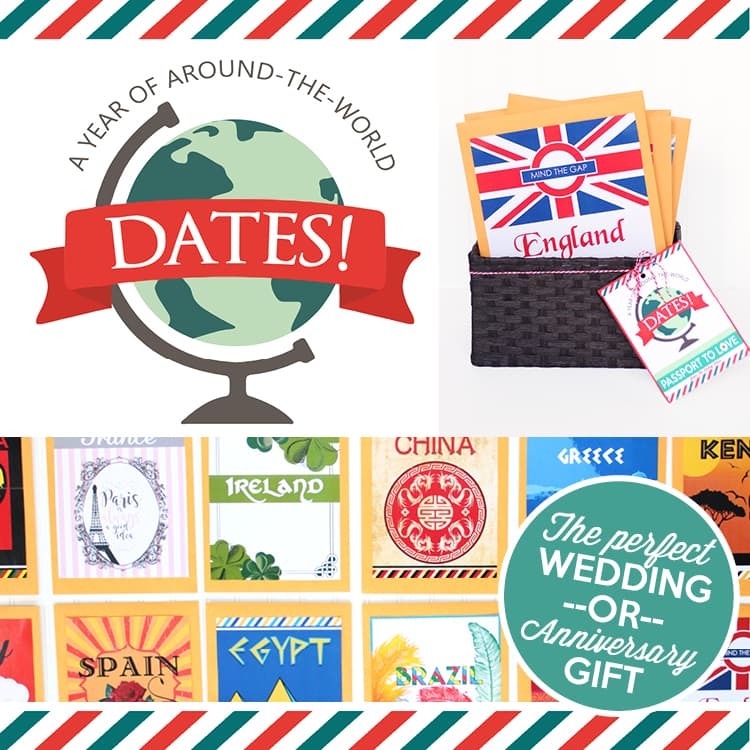 And don’t forget to check out our other Around the World Date Nights! You will absolutely love traveling the world with your spouse from the comfort of your own home. Cute printables, Kristen! Love this idea – it’s totally one we would do! Great job! What a fabulous idea!! LOVE it!! We are SO doing this! I like this date idea, and this may seem like a silly question, but how did the people from “China” prepare their food while they were enjoying appetizers in “Italy”? I’m interested in doing this date, but I am trying to figure out a few of those logistics. This looks SO fun, Carisa!! I haven’t done a progressive dinner in sooo long! What a fun idea! So CUTE!! 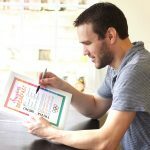 I love this super simple idea and amazing printables! Sooo excited to try this! Love the idea of doing it over a span of a month or so and rotating homes with friends! This is such a great idea. Everyone can help with the planning and it is very flexible – there are lots of options for the countries. It’s so fun!! Feels like an adventure with friends, but you can pull it off however works for you and your group! Hope you enjoy your dinner party as much as we did!! Ooh this is such a cute idea!! Thanks!! We thought so too! This is right up my alley! I LOVE things like this!